Well, who’s herding who is the way it usually starts out gathering bulls in heavy brush. Bulls come in a wide variety of disposition so you have to be ready to make a decision on how much pressure you need to apply in order to get this bull to conform to your wishes. These bushes are his home and he feels mighty comfortable using them to his advantage in order to stay there. 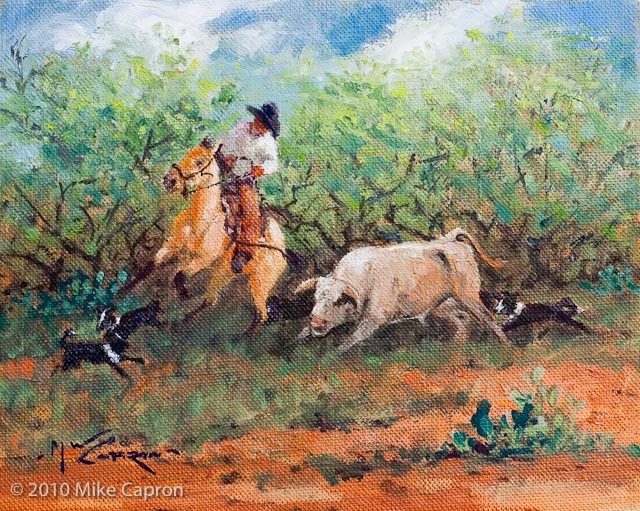 He can certainly out maneuver a man and a horse in thick brush so you want to take all the tools you feel comfortable with in order to convince this bull that it is more pleasant going with you than staying here in this tangled mess of mesquite, prickly pear and other assorted thorny growth. Cattle in thick brush or high mountains learn real quick how to use the environment to their advantage so it’s important that you and your horse are just as comfortable in these places as the bovine you are gathering. Cattle get away more often in these situations and soon learn how to make gathering them real interesting. Men who work in these conditions won’t feel the need to search for other forms of employment just for excitement. All tools are legal as long as they work and don’t damage the cattle. Don’t worry about your hide, it will heal. An assortment of tools and several extra plans are always handy. Good dogs are unequaled in rough terrain. Their maneuverability and aggressiveness can quickly overpower most bovine. Cattle are naturally afraid of a pack of dogs, like wolves and the dogs need to work like a pack of wolves. The only difference is that you have to have control of your dogs in order to impress the bulls. But even dogs are limited, some cattle get wise to a dog and can out run or make it so difficult that a dog gives out, especially in hot weather. This is when you resort to plan B. Its hard to use a rope or whip in heavy brush, but I saw a good cowboy on a good horse manage to rope a full grown Brahma bull by one hind foot in heavy brush and this bull was sure on the fight. Every time the bull went in the wrong direction he would stop and holler at the bull and if the bull turned to fight, the cowboy would simply turn and ride the opposite direction. This would pull the bull’s hind leg up between his front legs and make the bull change directions. This cowboy would then turn around and ride up a little closer giving the bull slack and then merely ride behind him very quietly. As long as the bull was going in the right direction at a walk the cowboy would let him go and it wasn’t long before this bull was sure broke to lead from the rear end. Nothing to it if you know what you’re doing and are sure mounted on a good pony. Another good tool is rat shot but don’t wait too long to use it. A mad hot bull won’t even feel it. I’ve seen men use long sharp sticks to gouge a bull out of a thicket but be careful; this can make a matador’s job look real simple. One of the most effective but also difficult to use is a colt 45 soft nose bullet. One of these placed in a horn base or an ear of the defiant bull will impress him more than all the cowboys in Texas. You can holler, Hey Bull! just before you send one of these through his horn or ear and the next time you see him, he’ll say “Yes sir, I understand completely”. It doesn’t matter how long it’s been since you shot him, he will remember you. But this impressive measure is not the final answer, it’s still necessary to know how to apply this to the proper pressure technique. But it can lead to complete confidence in your cattle gathering relationship. Another invaluable tool is your horse and his understanding of the environment and the cattle being gathered. Experience is the greatest asset but some horses have a rare cow sense that can be developed specifically to work tough livestock. One of the best examples of this is a video on YouTube called, “De Orpheo a Merlin de Rafi a Pablo”. Certainly this horse has been ridden and trained in the finest reining procedures but bottom line, even after the professional riding, this is truly a very unique animal not to mention his magnificent and very talented nature. I’ve seen only two horses in my life who rival this quality. I owned both of them and could certainly tell numerous stories about them. Both of them came to me second hand by accident and both had a different disposition. One was a kid horse and one was a killer. I was gathering cattle on killer one day in heavy brush and came onto a black muley bull hiding in a thicket. He sure thought he was hidden and plenty safe, my hoops and hollers didn’t impress him any and since he was muley, I thought the next best thing to do was charge in there and scare him to death. But the tables turned and after I leaped into his thicket he charged. There wasn’t much room to operate and not enough to escape the charge so killer did the next best defensive move; he wheeled and kicked Mr. Muley right between the head lights. Well it dropped Mr. Muley in his tracks. We had to wait some time before he regained any senses, I was beginning to wonder if we didn’t put his lights out permanently and was sure glad to see him stand up and look around to see where that sorrel killer went. I eased back into the thicket and asked him if he was ready to go now, that bull gave me a look as if to say, " Yes sir, just don’t put that sorrel horse on me again." Comments for "Who’s Herding Who?" Reita Prewit on September 01, 2010 Thank you, Mike. You have such talents with both writing and art and I know for a fact your inspirations come from the one and only, Ann. You guys make a good pair! Please continue to inspire the rest of us. Bert Madera on September 02, 2010 Great use of the english language, Mr. Capron. Thanks for the information and a great laugh as well. Mike Pardue on October 02, 2010 Mike, you are sure a man of many talents. I really enjoy reading your stories, you ought to think about putting together a book.